Progress in mathematics is based on a thorough understanding of the mathematical objects under consideration, and yet many textbooks and monographs proceed to discuss general statements and assume that the reader can and will provide the mathematical infrastructure of examples and counterexamples. This book makes a deliberate effort to correct this situation: it is a collection of examples. The following table of contents describes its breadth and reveals the underlying motivation--differential geometry--in its many facets: Riemannian, symplectic, Kadahler, hyperKadahler, as well as complex and quaternionic. Libraries, research mathematicians, undergraduate and graduate students, and mathematical physicists. [contents checked against book 8/14/90 TC] CONTENTS: Classical Groups I. The Eight Types of Inner Product Spaces. Classical Groups II. Euclidean/Lorentzian Vector Spaces. Differential Geometry. Normed Algebras. 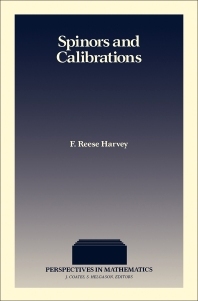 Calibrations. Matrix Algebras. Spinors: The Clifford Algebras (continued). The Groups Spin and Pin. The Clifford Algebras Cl(r,s) as Algebras. The Split Case Cl(p,p). Inner Products on the Spaces of Spinors and Pinors. Low Dimensions.